In an interview with On Being’s Krista Tippett last September, Ma invokes the great cellist Pablo Casals, the scientist Carl Sagan and the violinist Isaac Stern to illustrate how getting from one note to the next has cosmic resonance: “If you look at, to quote Carl Sagan, ‘the billions and billions of stars out there’ and what stirs the imagination of a young child ... you start wondering where are we? How do we fit into this vast universe? And [you look] to Casals saying that within the notes that he plays, he’s looking for infinite variety … [and] to Isaac Stern saying, the music happens between the notes. OK, what then do you mean when you say music happens between the notes? Well, how do you get from A to B? Is it a smooth transfer: it’s automatic, it feels easy, you glide into the next note? Or you have to physically or mentally or effortfully reach to go from one note to another? Could the next note be part of the first note? Or could the next note be a different universe? Have you just crossed into some amazing boundary and suddenly the second note is a revelation? Curiously, for a string player, in an interview with Elijah Ho for the San Francisco Examiner in January 2013, Ma responded to a question about which of the instrumentalists of the Golden Age had made the greatest impression on him by revealing his love for some of the finest pianists of the last century. His illuminating response was triggered when the journalist asked him if he ever had the opportunity to hear Vladimir Horowitz. On May 29, Ma joins the celebration of Sir Andrew Davis’ 40th anniversary with the TSO in a performance of Elgar’s intimate, passionate Cello Concerto, along with Dvořák’s the most popular concerto in the cello repertoire. Ma will undoubtedly make it all appear effortless. James Ehnes: In 2008 James Ehnes won the Gramophone Award for Best Concerto Recording of the Year for Elgar’s Violin Concerto with the Philharmonia Orchestra conducted by Sir Andrew Davis. That same year Ehnes’ recording of the Barber, Korngold and Walton concertos with the Vancouver Symphony conducted by Bramwell Tovey won the JUNO for Best Classical Album of the Year: Large Ensemble or Soloist(s) with Large Ensemble Accompaniment. That same recording won the 2008 Grammy for Best Instrumental Soloist(s) Performance with Orchestra. Shortly after that breakout awards year Ehnes sat down with Andrew Palmer for an interview for All Things Strings in May 2009. Palmer wondered how Ehnes keeps his performances fresh while on tour. Is there anyone for whom, or to whom, he performs? “My wife [ballerina Kate Maloney, whom he married in 2004] is on the road with me a lot—she’s actually here now—and she loves music, which is a good thing because she hears a lot of it! Every time I play I want to make sure she doesn’t regret going to concerts three times a week. And there’s something else in my psychology, which may result from where I grew up: Brandon, Manitoba, in the centre of Canada. Although it has a lot of music for a city of its size, it was always a big event when major stars performed there. But they only came once, so I was thrilled when they gave it their all. On the other hand, I was left feeling very bitter if I got the impression that they played a lot of concerts and that some were important and some weren’t, and that this one wasn’t. Believe me, there were a lot like that. Seen and Heard: April 8 at Koerner Hall, the Chamber Music Society of Lincoln Centre gave one of the most satisfying concerts of the season. The program was comprised of music written within a 35-year span of the mid-19th century: Mahler’s youthful Piano Quartet Movement in A Minor, Schumann’s Piano Quartet in E-flat Major Op.47 and Brahms’ Piano Quartet No.1 in G Minor Op.25. Co-directors of the Society (and married to each other), pianist Wu Han and cellist David Finckel (who spent 34 years as a member of the Emerson String Quartet) were joined by violist Paul Neubauer (formerly principal violist of the New York Philharmonic) and British virtuoso violinist Daniel Hope. Seating was fairly close with the violin and viola crowded together just beside the keyboard. The intimacy carried over into the performance which seemed the ultimate in musical sophistication. Hope sang eternal in the gem of beauty composed by the 16-year-old Mahler. Exquisite string playing throughout was finely supported by Wu’s unruffled piano; impeccable ensemble playing with great expressiveness that was never showy or gauche. The piano was more of a factor in the Schumann, its joyful first movement anchored by Finckel’s sublime cello. The mad dance of the Scherzo was led by the cello with the piano particularly sensitive in the many quick and delicate staccato passages that had to be navigated. The Andante cantabile which followed is one of Schumann’s most beautiful creations; a real treat. The Brahms was thick with melody as various instrumental combinations came to the fore during the opening movement’s development. A beautiful theme emerged from the ethos with great delicacy on the violin as the piece continued through to the Andante con moto, its violin and cello parts reminiscent of the composer’s Double Concerto. The Gypsy tune at the centre of the Rondo alla Zingarese broadened out led by the piano to an exquisite duet between cello and viola before the violin picked up the tune, the DNA of which Brahms found (happily) impossible to shake. It was a night where the Romantic melodists reigned supreme. May 1 Evgeny Kissin’s RTH recital, which moves from Beethoven’s “Waldstein” Sonata to Prokofiev’s Fourth through three nocturnes and six mazurkas by Chopin and Liszt’s “Rackoczi March,” is almost completely sold out at press time. May 1 Jacques Israelievitch and pianist Valentina Sadovski perform works by Schumann and Saint Saëns at Grace Church, 700 Kennedy Road, Scarborough. May 14 Israelievitch and pianist Stephen Cera play pieces by Fauré and Bridge at Briton House Recital Hall. May 2 The Cecilia String Quartet plays Mozart’s String Quartet K590 and Mendelssohn’s String Quartet Op.44 No.2 at the Burlington Performing Arts Centre. May 6 Emerging violinist Augustin Hadelich performs Mendelssohn’s enduring Violin Concerto Op.64 with the TSO led by Peter Oundjian. May 27 and 28 the elegant Louis Lortie is the soloist in Liszt’s Piano Concerto No.1 with the TSO under Sir Andrew Davis, the same soloist (Lortie was 18! ), concerto and conductor as in the orchestra’s groundbreaking 1978 visit to China. Ravel’s scintillating orchestral version of Mussorgsky’s Pictures at an Exhibition completes the evening’s program. June 4, 6 and 7 Oundjian leads the TSO’s exciting “All American” lineup: John Adams’ Short Ride in a Fast Machine; Barber’s Symphony No.1; André Previn’s Double Concerto for Violin and Violoncello (Canadian première/TSO co-commission) with soloists Jaime Laredo and Sharon Robinson; and Gershwin’s An American in Paris. May 9 Violinist Joyce Lai and cellist Rachel Mercer are the soloists in Brahms’ compelling Double Concerto. The Canadian Sinfonietta (led by Tak Ng Lai) concludes the celebration of the composer’s birthday (May 7) with a performance of his seminal Symphony No.1. May 12 TSO bassoonist Samuel Banks is group of 27’s recital soloist in a concert at Heliconian Hall, complimentary food provided by Cheese Magic and Wanda’s Pie in the Sky. Also May 12 members of the COC Orchestra combine their virtuosity and artistry to perform Georges Enescu’s lush Octet for Strings in C Major, Op. 7. May 13 Kent Nagano and the Orchestre symphonique de Montréal celebrate Sibelius’ 150th anniversary with his tuneful and heroic Symphony No.2. In the first half of this TSO presentation, Piotr Anderszewski joins the Montrealers for Mozart’s magisterial Piano Concerto No.25 K503. May 14 Artists of the COC Orchestra and guest harpist Lori Gemmell perform pastoral works by Arnold Bax (Elegiac Trio for flute, viola and harp), Béla Bartók (String Quartet No.4) and Maurice Ravel (Introduction and Allegro) in a free noontime concert. May 16 The recently formed XIA Quartet consists of Edmonton Symphony Orchestra concertmaster Robert Uchida and TSO violinist Shane Kim, assistant principal violist Theresa Rudolph and principal cellist Joseph Johnson. It makes its Toronto debut in a wide-ranging program of Haydn, Bartók and Beethoven (the buoyant Op.59 No.1).Also May 16 Ensemble Polaris plays new music created to accompany short films (from Ryerson University’s School of Image Arts) on the idea of “home” and “away,” shot in Iceland, New Zealand, France and Italy. May 22 Gallery 345 presents the Ton Beau String Quartet with clarinetist Peter Stoll performing Ravel’s String Quartet in F, Brahms’ Clarinet Quintet and Gershwin’s Three Preludes (arr. Stoll). Also at Gallery 345 May 30 Trio McMaster’s recital is filled with the cream of the piano trio repertoire: Schubert’s Piano Trio No.1; Fauré’s Piano Trio Op. 120; Beethoven’s Trio Op.70 No.1 “Ghost” and Mendelssohn’s Trio No.1 Op.49. May 24, 25 The Canzona Chamber Players smartly program Haydn’s Gypsy Trio, Bartók’s Suite for Piano, Op.14, Schumann’s Five Pieces in Folk Style for Cello and Piano, Ravel’s Tzigane and Dvořák’s Dumky Trio with Yosuke Kawaski, violin, Wolfram Koessel, cello, and Vadim Serebryany, piano. May 26 Mexican-Canadian pianist Alejandro Vela mixes the freshness of Latin American composers Lecuona (Noche azúl, Córdoba, La comparsa, Gitanerías), Ginastera (Sonata No.1) and Corea (Armando’s Rhumba), with standards by Chopin (Ballade No.1) and Rachmaninov (Five Preludes, Op. 23) in his free noontime COC concert. May 28, in another free Richard Bradshaw Amphitheatre recital, Toronto Summer Music artistic director Douglas McNabney offers a sneak preview featuring emerging artists and music from the upcoming festival. June 2 violinist Véronique Mathieu and pianist Stephanie Chua perform rarely heard works by women composers Heather Schmidt, Louise Farrenc, Clara Schumann, Elizabeth Jacquet de la Guerre and others in their free noontime COC recital. May 30 5 at the First Chamber Music Series presents two sublime chamberworks: Mozart’s Clarinet Quintet in A, K.581 and Brahms’ Clarinet Quintet in B Minor, Op.115, with Yao Guang Zhai, clarinet, Marie Bérard, violin, Yehonatan Berick, violin, Teng Li, viola, and Rachel Mercer, cello. May 31 Acclaimed cellist Winona Zelenka is the soloist in Elgar’s beloved Cello Concerto with Orchestra Toronto conducted by Kevil Malloon. June 2 The Kitchener-Waterloo Chamber Music Society presents the Penderecki Quartet performing Beethoven’s celestial Quartet No.14 Op.131 and, with cellist Pamela Highbaugh-Aloni, Schubert’s glorious Quintet in C. The K-WCMS bills it as “Concert of the Century” rightly pointing out that these are two of the five greatest chamber works ever written. The remarkable French-born pianist Hélène Grimaud last visited Toronto a year ago when she performed Brahms’ Piano Concerto No.1 with the TSO and showed off her great dynamic range. Her intimate pianism exposed the intrinsic beauty of the slow movement and she entered fully into the passion of the third movement with its rhapsodic cadenza, spurring the audience into an immediate standing ovation. The year before she held the Koerner Hall audience in her sway with a performance of her Resonances CD that moved from Mozart to Berg to Liszt to Bartók, all united by the historical fact of the composers being children of the Austro-Hungarian Empire. Her upcoming Koerner Hall appearance April 19 is typical of her adventurous spirit and imaginative programming. All the pieces are united by the theme of water: Berio’s Wasserklavier III; Takemitsu’s Rain Tree Sketch II; Fauré’s Barcarolle No.5 in F-sharp Minor, Op.66; Ravel’s Jeux d’eau; Albéniz’s Almería from Iberia Suite Book 2; Liszt’s Les jeux d’eaux à la Villa d’Este from Années de pèlerinage: Troisième année, Janáček’s In the Mists I; Debussy’s La Cathédrale engloutie from Préludes, Book I; concluding with Brahms’ Piano Sonata No.2 in F-sharp Minor, Op.2. Ten days after her Toronto concert she performs with the Stamford Symphony Orchestra to bring awareness to her other passion: environmental education centred around wolves – she founded the Wolf Conservation Center in South Salem, New York in 1996. Evgeny Kissin: Evgeny Kissin’s mother was a piano teacher, his father an engineer. When Kissin was born (in Moscow in 1971), his sister, who was more than ten years older, was learning the piano. In Christopher Nupen’s DVD Evgeny Kissin: The Gift of Music, Kissin tells a tale one would be inclined to dismiss as apocryphal were it not for everything that has happened to him since. He had been a quiet baby, even standing on his cot in silence as his sister practised. When he was 11 months old, he opened his mouth and sang the Bach fugue she had just been playing (the Prelude and Fugue in A-Major from the 2nd book of the Well-Tempered Clavier). By the time he could reach the keyboard he was two and on his way to superstardom. May 1 marks Kissin’s first solo recital at RTH in 15 years; his most recent appearance with the TSO was in May of 2012. It’s a virtuoso program beginning with Beethoven’s Sonata No.21 in C major, Op.53 “Waldstein” with its glorious third movement, followed by Prokofiev’s quietly charming, utterly logical Sonata No. 4 in C minor, Op.29. Then three nocturnes and six mazurkas by Chopin lead into Liszt’s Hungarian Rhapsody No. 15 S.244/15 “Rákóczi March,” a quixotic foot stomper. Kissin’s popularity is immense, his intellectual and musical gifts even more so. He once said that the main purpose of music is “that it elevates us into the world of the sublime.” The evening should be memorable. Seen and Heard:The elegant Vadim Repin shone in his Russian repertoire – Stravinsky and Tchaikovsky – in Koerner Hall March 6; The Vienna Piano Trio displayed an exemplary sense of ensemble and an unusually close seating arrangement in their well-received recital March 8 highlighted by Beethoven’s Kakadu Variations and two Mendelssohn Andantes (from his Trio Nos.1 and 2; the latter played as an encore); Till Fellner brought exceptional musicianship to Mozart’s Piano Sonata K282 on March 10. Kudos to Music Toronto’s Jennifer Taylor for bringing us Fellner as well as the London-based Elias Quartet March 19. French sisters Sara and Marie Bittloch on violin and cello set the tone for the quartet’s intimate sound and its impeccable sense of ensemble. Equally attentive were second violinist Scotsman Donald Grant and Swedish violist Martin Saving. Together the foursome brought heavenly pianissimos and wonderful silences that allowed Mozart’s music to breathe in his “Dissonance” Quartet K465 and unrelenting anger and passion to Mendelssohn’s last string quartet without losing the ruminative lyricism of its slow movement. April 8 and 9 former TSO music director Jukka-Pekka Saraste returns to conduct Mahler’s glorious Symphony No.5 and accompany pianist Valentina Lisitsa in Rachmaninoff’s romantic masterpiece, his Concerto No.2. Conductor Peter Oundjian, soprano Isabel Bayrakdarian, violinist Sergey Khachatryan and pianist Serouj Kradjian join with the TSO April 22 for a concert celebrating Armenian music. It includes a double dose of Aram Khachaturian as well as the world premiere of Mychael Danna’s Ararat, a suite Danna constructed from his soundtrack to Atom Egoyan’s film of the same name. May 6 finds Oundjian supporting the up-and-coming twentysomething German violinist Augustin Hadelich in Mendelssohn’s justly celebrated Violin Concerto, a work which will appear on his next CD later this spring. April 8 the co-artistic directors of the Chamber Music Society of Lincoln Center, cellist David Finckel (ex-Emerson Quartet) and pianist Wu Han, are joined by the versatile violinist Daniel Hope and violist Paul Neubauer in a compelling program of piano quartets by Mahler [Movement in A Minor], Schumann [E-Flat Major Op.47] and Brahms [No.1 in G Minor Op.25] at Koerner Hall. Also at Koerner Hall, April 24, take advantage of a rare chance to hear international superstar Yannick Nézet-Séguin conduct his hometown ensemble, Orchestre Métropolitain in a program of English music: Vaughan Williams’ Symphony No.4; Elgar’s indelible Enigma Variations and his ever-popular Cello Concerto with 20-year-old cellist Stéphane Tétreault as soloist. April 10 the Mercer-Oh Trio play Haydn, Jean Lesage and Smetana under the auspices of the Kitchener-Waterloo Chamber Music Society. Pianist Eric Himy shows off his technical prowess in a program of Rachmaninov, Scriabin, Chopin, Albéniz and de Falla April 25. Still in Waterloo, TSO violinist Arkady Yanivker leads the Toronto Serenade String Quartet in music from Latin America April 28 while on May 2 it’s Sofya Gulyak of London’s Royal College of Music who tests the mettle of the Music Room’s piano in music by Liszt, Coulthard and Mussorgsky. She repeats the program in Toronto May 3 under Syrinx’s banner at the Heliconian Hall. April 12 Syrinx presents the Seiler Trio (violinist Mayumi Seiler, cellist Rachel Mercer and pianist Angela Park) playing Beethoven’s beloved Archduke Trio, Mendelssohn’s Trio No.2 and Kevin Lau’s Trio. April 13 finds the Associates of the Toronto Symphony saluting the double bass with music of Rossini, Boccherini and Dvořák. Double bassist Tim Dawson teams up with violinists Etsuko Kimura and Angelique Toews. violist Christopher Redfield and cellist Marie Gelinas at Trinity-St. Paul’s Centre. April 16 Music Toronto presents the Lafayette Quartet, an all-female ensemble who have remained together since their founding in 1986, a distinct rarity. Since then they have spent their time entertaining audiences and teaching some of Canada’s finest young string players from their base at the University of Victoria. Their program includes a middle Haydn quartet (No.28, Op.29, No.6), a late Beethoven (No. 15, Op.132) and Jean Coulthard’s String Quartet No.2, “Threnody.” The latter two pieces will be part of their Chamber Music Hamilton concert April 19. April 17, group of 27: TSO principal oboist Sarah Jeffrey brings her warm sound to Mozart’s tuneful Oboe Concerto K314; Symphonies by C.P.E. Bach (the wild and beautiful Wq.179) and Haydn (No. 19), along with Jocelyn Morlock’s addictive Disquiet complete an intriguing group of 27 program. The group’s founder and music director, the dynamic Eric Paetkau, whom I interviewed in the December/January issue of The WholeNote, has just been named music director of the Saskatoon Symphony Orchestra. The night before the concert, April 16, The WholeNote will be hosting an open rehearsal of the group at the Centre for Social Innovation, 730 Bathurst St., ground floor. Doors open at 7:30pm. Experience g27’s lively playing in a casual, intimate atmosphere. April 25 Karin Kei Nagano, the teenage daughter of conductor Kent Nagano and pianist Mari Kodama (read the glowing review of her recording of all 32 Beethoven sonatas elsewhere in this issue), joins her mother for what should be a memorable afternoon of piano music; part of the BravoNiagara! Festival of the Arts. The Vienna Piano Trio’s previous Toronto appearances – with the Women’s Musical Club in November 2005 and three visits to Toronto Summer Music from 2010 to 2012 – were greeted with widespread acclaim. So it’s no surprise that they are highly anticipating their Mooredale Concerts recital March 8. That’s what the gregarious Stefan Mendl, the trio’s pianist and last remaining of its founding members, told me recently by phone from Vienna, the city where he has lived since his birth. I asked him about the particular sensibility that typifies a chamber musician. “From scratch you must have the urge to find a special sound that is the group sound,” he answered. “You should not be so restrained that nobody can hear you but neither are you so predominant that you drown out the others. It must be your goal from the beginning that you find this sound; if you have a good ear and if you have the will to do this, then you are off to a good start. In his own case, right from his first experience on stage, chamber music felt better. “I discovered early on in my soloist days [born in 1966, he founded the trio in 1988] that I enjoyed playing concertos much more than recitals. I think that sometimes you get more ideas or better ideas when you have the chance to interact with others. At least for me that’s the case and I feel very, very comfortable with friends and with colleagues on stage. I don’t feel that comfortable when I’m on my own. “And of course there is the wonderful music that is written for piano trio, piano quartet and piano quintet [he regularly performs with the Hagen Quartet]. Sometimes, all of our greatest composers put a lot of their inner feelings and emotions into their chamber music. I find it all very fascinating, still,” he said, with a laugh that underlined the hold the music still has on him. This was a good opportunity to bring up the relationship between recording and live performance since the trio released the Kakadu variations along with Beethoven’s Trios Op.70, on their latest MDG Gold CD last year. “Recording something always affects your live playing because you get so close to it. You listen more to detail than you would otherwise ... sometimes you get things brought out that you probably wouldn’t have discovered before and then your performance is altered. Of course, your performance always changes over time,” he said. Mendelssohn’s Trio No.1 Op.49 in D Minor, the concluding piece on the March 8 program, is the more famous of the composer’s two trios, but for Mendl, they are both on the same genius level. The trio plays them frequently and loves both of them. Mendl particularly enjoys the “gorgeous and brilliant and skillful piano writing which hardly any great composer has accomplished to that extent. I was curious about the formidable list of mentors on the Vienna Piano Trio’s website, almost all of whom the trio met during a memorable two-week chamber music workshop in New York in 1993. “We’d never been to New York before so it was a double experience, really mind-blowing I would say, without exaggeration.” They got several lessons from Isaac Stern, the Guarneri Quartet (Arnold Steinhardt and Michael Tree), from Henry Meyer of the LaSalle Quartet and from the Kalichstein-Laredo-Robinson Trio. Mendl still remembers the kindness of Jaime Laredo who brought them back to New York for a concert series. Seen and Heard:The RBC Piano Extravaganza – or “Ax-travaganza” as Mervon Mehta dubbed it – took the city by storm over an 11-day period attracting approximately 14,000 to events at RTH alone. In addition, 27 amateurs performed on the hall’s newly acquired New York Steinway during the Community Piano Showcase; including the Young People’s Concert programs, 20 pianists performed on the RTH stage during the festival; and 200 people played the five Steinways in the festival’s inaugural event, Pianos in the City, February 4 between 11am and 2pm. My immersion in the Extravaganza began on its second day, Thursday February 5, with festival curator Emanuel Ax’s introduction of two young pianists at a COC free noontime concert. Siberian-born Pavel Kolesnikov, the 2012 Honens Competition winner now studying with Maria João Pires in Brussels, learned three Liszt transcriptions of Wagner operas, including the “Pilgrim’s Chorus” from Tannhäuser, especially for the event. Impressive. American pianist Orion Weiss, who left his native Cleveland for Juilliard, specifically to study with Ax for his integrity and revelatory playing, brought a singing touch to a pair of Granados Goyescas. Several hours later they played a dynamically well-matched Rachmaninoff Symphonic Dances for two pianos that preceded a TSO concert that included the orchestral version of the same piece. Ax began that program with an agreeable, self-effacing rendition of a Schubert impromptu followed by Mozart’s Piano Concert No. 14 K449. Round tones of limpid liquidity gave the impression that the pianist was opening a musical jewel box. The four-hour and twenty-minute Pianopalooza Sunday afternoon included 16 disparate performers selected by the RCM in a musical cavalcade that came close to filling Koerner Hall and concluded with a show-stopping, two-piano-eight-hands version of Tchaikovsky’s 1812 Overture complete with recorded cannon shots. The event featured two bona fide highlights: Robi Botos’ jazz set was an uninterrupted 20-minute piece of spontaneous joy; Ax’s melodic, technically assured performance of Chopin’s Scherzo No. 2 was piano playing at its best. Three days later, Ax joined Jan Lisiecki for Mozart’s heavenly Concerto for Two Pianos K316a/365 and Saint-Saëns’ delightfully entertaining The Carnival of the Animals. The next day in a pre-concert performance, Ax displayed his chamber music skill set in an immensely satisfying reading of Schumann’s Piano Quintet Op. 44. The string parts were taken by the first chair TSO players, concertmaster Jonathan Crow, principal second violinist Paul Mayer, prinicipal violist Teng Li and principal cellist Joseph Johnson. The players faced the choir loft, which overflowed into the adjacent sections of the hall. No one who heard them will forget the strings’ strength, the way Ax was able to emerge from the background to point out the melody and the assured playing of this propitious gathering. Later that evening Ax demonstrated a deft curatorial touch in an adventurous program pairing a two-piano piece with its orchestral equivalent. Ax and Stewart Goodyear, more or less balanced in selected pieces of Carl Maria von Weber, returned for an exciting performance of Ravel’s La Valse. In between Anagnoson & Kinton proved to be very well-matched in an apparently seamless gambol through Brahms’ Variations on a Theme by Haydn. As in the previous week’s Rachmaninoff Symphonic Dances, the orchestral colour was more varied than the keyboards’ but the unique opportunity to hear the difference was welcome. Ax spoke of his love of the word “metamorphosis” when he introduced that program. The next morning he became its agent at a master class for Glenn Gould School students. He was his usual combination of self-effacing and endearing as his analysis and advice transformed a student’s performance of Chopin’s Barcarolle, a piece he called “ecstatic” and which he linked forward to Wagner and back to Bach. He continued his delicate balance of dispensing compliments, ever careful that his suggestions would not be construed as outright criticism. Mar 6 Siberian-born violinist Vadim Repin, the interview subject of my last month’s column, makes his eagerly awaited Toronto recital debut at Koerner Hall in a diverse program of Bartók, Debussy, Ravel, Stravinsky and Tchaikovsky. Mar 8 at Koerner Hall KahaneSwensonBey, who re-formed in 2012 after a 25-year hiatus, perform piano trios by Mozart, Schumann, Ravel and Schoenfield. In an unfortunate scheduling conflict their afternoon concert occurs at the same time as the Vienna Piano Trio’s Mooredale recital in Walter Hall just minutes away. On the evening of Mar 8 violinist Moshe Hammer and pianist Angela Park perform works by Brahms, Franck and Sarasate at the Aurora Cultural Centre. Mar 11, 12 and 14 Gianandrea Noseda conducts the TSO in a program featuring Beethoven’s Symphony No. 7, which is all you need to know to make plans to attend. The program also includes Adrianne Pieczonka performing Wagner’s Liebestod from Tristan und Isolde and Richard Strauss’ divine Four Last Songs, which further certifies it as a must-see. Rising star Krzysztof Urbanski and the TSO are joined Mar 27 and 28 by the captivating Sol Gabetta in Dvořák’s masterpiece, his Cello Concerto in B minor, Op. 104, a work they have played together many times. Then Urbanski leads the orchestra in Stravinsky’s rhythmic revelry, The Rite of Spring. Another must-see. TSO associate principal clarinetist Yao Guang Zhai is joined by pianist Jeanie Chung for Luigi Bassi’s Concert Fantasy on themes from Verdi’s Rigoletto in a free COC concert also featuring Gershwin, Brahms and three solo pieces by Stravinsky at the Richard Bradshaw Amphitheatre Mar 12. Mar 14 is crystal ball gazing time when students from the Phil and Eli Taylor Performance Academy for Young Artists give a free concert in Mazzoleni Hall. On Mar 31 another Mazzoleni Hall free concert (ticket required) features solo and chamber works performed by Rebanks Fellows from the Glenn Gould School. Apr 2 three of the Rebanks Fellows perform Brahms’ gorgeous Trio for horn, violin and piano in a free noontime COC concert. Mar 15 Trio Arkel with guests, cellist Amanda Forsyth and violinist Aaron Schwebel, perform Schubert’s sublime String Quintet in C in the Church of the Holy Trinity. Mar 16 group of 27 presents Payadora Tango Ensemble and g27 violinist Rebekah Wolkstein in a recital at Heliconian Hall. Don’t miss your chance Mar 19 to hear the Elias String Quartet, the “excellent” (New York Times), “exuberant” (The Guardian) young British ensemble making their local debut presented by Music Toronto, in works by Haydn, Mozart and Mendelssohn. Mar 22 Alliance Française presents Stravinsky’s tuneful fable The Soldier’s Tale featuring Jacques Israelievich, violin, with Uri Mayer conducting. Mar 27 Violinist Lisa Batiashvili, Till Fellner’s trio partner (along with Alfred Brendel’s son Adrian) is joined by pianist Paul Lewis in his first Toronto appearance since his remarkable debut opening the Women’s Musical Club’s 115th season in the fall of 2012. Their program includes Schubert’s “Grand Duo” and “Rondeau brilliant,” Beethoven’s Violin Sonata No.10, Op.96, Telemann’s Fantasia No.4 for Solo Violin and Busoni’s arrangement of Bach’s Chorale Prelude “Nun komm’ der Heiden Helland” for solo piano. Mar 27 and 28 the incomparable Kitchener-Waterloo Chamber Music Society presents concerts 13, 14, 15 and 16 in the Attacca Quartet’s ongoing series performing all 68 of Haydn’s quartets. Each concert features quartets drawn from the early, middle and later period of the composer’s life. YouTube star Valentina Lisitsa’s piano playing has struck quite a few chords based on upwards of 80 million views. Before her Royal Albert Hall recital in front of an audience of 8000 in June 2012 her fans had the chance to vote online for their preferred program – a form of audience participation that has become one of Lisitsa’s trademarks. Will the contents of her BravoNiagara! solo concert Apr 4 be similarly chosen? Russian-born Vadim Repin may just be the best violinist you’ve never heard of. Unless you happened to catch his TSO appearance in 2007 playing Prokofiev’s Violin Concerto No.2 with guest conductor Thomas Dausgaard, his only exposure here has been through recordings (most recently with Deutsche Grammophon) and YouTube clips. The clips span almost 30 years of an acclaimed career that took international flight after he won the prestigious Queen Elisabeth Competition in Brussels in 1989 when he was only 17. This virtuoso, for whom technique is always a means to a musical end, never an end in itself, began violin lessons at five by “pure chance.” His mother, who had been encouraging her son to play with musical toys since he was three, took him to school intending to sign him up for accordion studies. Only violin places were available so he took up the violin. By age seven, chance took him under its wing again; his teacher advised studying with Zakhar Bron (who later taught Maxim Vengerov and Daniel Hope), a relationship which would continue for 13 years. Seen and Heard: After each standing ovation that followed his performances of three Beethoven piano concertos with the TSO in November, 19-year-old budding superstar Jan Lisiecki would take a seat at the piano and confidently greet the RTH capacity crowd with the words “Good evening.” He added at the last of his six concerts, “As has become traditional, I will now play some Chopin.” The Nocturne No. 20 in C Sharp Minor, Op. Posth. followed, flowing as naturally as the encores in the first two programs, the Prelude Op.28 No.1 and the Etude Op.25 No.1. Like putting on a comfortable shirt. Lisiecki’s playing of the first movement of the Fourth Piano Concerto on November 12 had an almost fortepiano quality; the melancholy second movement had a conversational tone until it time-travelled into the future before meeting up with the impetuous Rondo. At intermission TSO composer advisor Gary Kulesha asked Lisiecki to compare Beethoven to Mozart and Chopin, the latter two composers having supplied the contents of the pianist’s two Deutsche Grammophon CDs. “In Mozart you’re completey exposed – elegant; in Chopin you can play the concerto without the orchestra; in Beethoven you’re a member of the orchestra,” he responded. “My modus operandi is to make the piano sing,” Lisiecki said. Along with a wonderful tone, that’s his approach to every piece he plays. Three days later came a first-rate performance of the Third. It had great cohesion, its architecture proceeding organically from the propulsive Allegro con brio and delicacy of the Largo to the pure joy of the inverted theme after the Rondo’s cadenza. You could feel the composer’s notes straining against classical convention but revelling in it. In the Chopin etude, Lisiecki demonstrated the beauty of tone over technique. Lisiecki’s playing of the “Emperor” the following Saturday was dynamically diverse yet always controlled, from the wondrously hushed non-cadenza of the Allegro and the magical Adagio which felt as though the piano’s notes were walking on air, to the radical contrasts of the Rondo. Talking about his instrument and the fact that every pianist is at the mercy of the venue where he performs, he raved about the piano at Koerner Hall, declined to comment on those at RTH and gushed over the one he played in Hamburg. “Not knowing what to expect forces us to create art in the moment,” he said. Lisiecki too fell under his spell as the two musicians intently locked eyes at the beginning of the finale of the “Emperor,” the young Canadian drawing on the Dane’s energy. Trifonov Trifecta: Daniil Trifonov, only 23, the 2011 Tchaikovsky Competition multi-award-winner, having already proved his technical prowess at the Arthur Rubinstein International Piano Master Competition earlier that year, seemed intent on establishing his artistic reputation with three programs available to Toronto audiences this season. The first, a dazzling performance of Rachmaninov’s Rhapsody on a Theme by Paganini with the TSO took place in September. An ambitious solo recital December 9 at Carnegie Hall will be live streamed on medici.tv (and available free for 90 days thereafter). Consisting of Bach’s Fantasy and Fugue for Organ in G Minor, BWV 542 (transcribed for piano by Franz Liszt, S. 463), Beethoven’s Piano Sonata No. 32 in C Minor, Op. 111 and Liszt’s Transcendental Etudes, it will likely add to his burgeoning reputation. Then on January 20 at Koerner Hall, Trifonov turns to chamber music with the great Gidon Kremer. Mozart’s Violin Sonata No. 33 in E-flat Major, K. 481. Schubert’s Fantasy in C Major, D. 760 and Rachmaninov’s Trio élégiaque No. 2 in D Minor, Op. 9 comprise a program that will certainly reveal yet another side of this talented Russian-born phenom. A Trio of Quartets: Music Toronto presents the latest incarnation of the Juilliard String Quartet January 8 in a program headed by Webern’s shimmering Five Movements, Op.5. Three weeks later the mighty St. Lawrence String Quartet returns for its annual visit to its first home. The exuberant Geoff Nuttall will lead us in a “Haydn Discovery” followed by the father of the string quartet’s Op. 33, No.2 “The Joke.” A major new work by John Adams fills the concert’s second half. On January 6 the New Orford String Quartet treats us to Beethoven’s Op. 95 and Brahms’ Op. 51, No.1 before premiering a new work by Gary Kulesha. The New Orford then teams up with Amici February 1 for one of the most interesting programs of the new year, “Bohemian Contrasts.” They join cellist David Hetherington and violist Teng Li in a performance of Schulhoff’s String Sextet and Joaquin Valdepeñas in Brahms’ unforgettable Clarinet Quintet in B-minor, Op.115. Pianist Serouj Kradjian fills out the rest of the program with piano works by Liszt and Janáček. KWCMS’s 40th: The Kitchener-Waterloo Chamber Music Society has designated the week of November 28 to December 7 to mark its considerable achievement. Over the years the cumulative volume of talented performers who have made their way to Jan and Jean Narveson’s home is astonishing enough, but it is the KWCMS’ penchant for programming complete cycle concerts that really makes one sit up and take notice. [For a glimpse into how they do it, see my October 2013 Classical and Beyond column.] Two cycles over the December-January period caught my eye: Trio Celeste’s complete traversal of Beethoven’s Piano Trios December 12, 14 and 16; and the scintillating Duo Concertante performing Schubert’s complete music for violin and piano January 29 and 31. It promises to be an even more musically satisfying event than the Beethoven. Schubert’s music in this case is consistently of the highest order, charming and melodious; the opportunity to hear all of it should not be missed. Dec 6 the prodigious Stewart Goodyear performs Tchaikovsky’s The Nutcracker entirely on the piano joined by dancers from the National Ballet School of Canada and Ballet Creole, and singers from the Toronto Children’s Chorus. Dec 7 two recent Glenn Gould School appointees, celebrated pianist John O’Conor and former first cellist of the Cleveland Orchestra, Desmond Hoebig, team up for Beethoven’s serene Cello Sonata No.3 in A Major, Op.69. O’Conor will play a selection of Nocturnes by his Irish countryman John Field and by Chopin; Yehonatan Berick, Cordelia Paw and Barry Shiffman join them for Schumann’s masterful Piano Quintet in E-flat Major, Op.44. Dec 7 two admirable pianists make their Toronto debut in Mooredale Concerts’ “Piano Dialogue.” Wonny Song will play Beethoven’s Moonlight Sonata and David Jalbert Poulenc’s Les soirées de Nazelles before coming together for duets by Ravel and Schubert and Rachmaninoff’s Suite No.2 in C Major, Op.17 for two pianos. Dec 12 Anastasia Rizikov brings her already considerable 15-year-old experience to Chopin’s Piano Concerto No.1 accompanied by Sinfonia Toronto before performing a staggering KWCMS solo concert Jan 24. Bach, Chopin and Liszt lead in to Mussorgsky’s Pictures at an Exhibition; then after intermission Chopin and Mozart precede Balakirev’s fiendishly difficult Islamey. Jan 9 Angela Hewitt, the subject of this month’s cover story, is joined by mezzo-soprano Anne Sofie von Otter in a program rich in songs by Beethoven, Schubert, Brahms, Fauré, Debussy and Chaminade. Interspersed between them Hewitt will play piano music by Schubert, Brahms and Chabrier. Jan 14, 15, 17 and 18 mark the beginning of the TSO’s Mozart@259 festival curated by Les Violons du Roy’s Bernard Labadie. The impressive young British conductor and keyboardist Matthew Halls leads the orchestra in three varied programs showing Mozart’s range as an instrumental composer. Jan 22 to 25 will see the Montreal Symphony’s Kent Nagano make a rare foray into the forest of period instruments as he leads Tafelmusik in performances of Beethoven’s Symphony No.5 in C Minor, Op. 67 and his Mass in C Major, Op.67. It will be fascinating to compare this performance of the symphony to that in Nagano’s recent recording [reviewed by Richard Haskell in this issue of The WholeNote]. Feb 7 Pinchas Zukerman makes his final Toronto appearance as music director of the National Arts Centre Orchestra in an RTH program with two of Brahms’ most beloved concertos. Zukerman is joined by NAC principal cellist Amanda Forsyth for the Double Concerto for Violin and Cello in A Minor, Op.102; Yefim Bronfman is the soloist in the Piano Concerto No.2 in B-flat Major Op. 83, the epitome of 19th century romanticism. 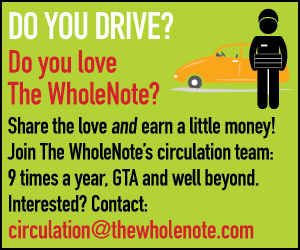 Paul Ennis is managing editor of The WholeNote. He can be reached at editorial@thewholenote.com.